England cricketer in the running for manager's job at Sussex football club? Mason Crane in action for Hampshire. A Sussex football club is advertising for a new manager - and has England cricketer Mason Crane thrown his name into the hat? Worthing United, who play in SCFL Division 1, parted company with Matt Evans at the weekend and are on the look-out for a new manager. Crane, a 21-year-old leg-spinner from Worthing, made his Test debut for England in the Ashes earlier this year but has missed the majority of this season with a back injury. 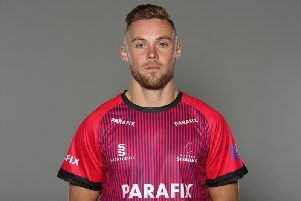 The talented bowler, who has taken 152 wickets for Hampshire in all competitions, clearly has tactical nous and an eye for a player when it comes to Football Manager as well, with 63 trophies won during his time as Arsenal boss on the game. Replying to Mavericks' tweet for a new manager after Matt Evans was relieved of his duties, Crane said: "Will these credentials do? @FootballManager #stressie." Along with the message, he posted the following impressive resume: "Mason Crane's first non-playing role was as Arsenal's manager. "During his time with the Gunners, Crane's team lifted the English Premier Division in 2022, 2023, 2026, 2027, 2029, 2029, 2030, 2031, 2033, 2035, 2036, 2037 and 2038, the Club World Championship eight times between 2019 and 2037, won the European Champions Cup eight times between 2019 amd 2037, the EURO Cup in 2018 and 2021, the European Super Cup seven times between 2018 and 2037, the FA Cup seven times between 2020 and 2035, the Carabao Cup seven times between 2023 and 2035 and the English Community Shield ten times between 2017 and 2038." He boasts an impressive win percentage of 73 from 1,278 games and Worthing United replied to Crane by saying: "What a CV that is Mason! Get your application in!" Crane will hope more opportunities come his way with the England cricket team in the future but down the line, could he be a football manager in the making? The closing date to apply for the Worthing United manager's job is midday next Wednesday (October 3). Interviews will then take place in the week commencing October 8. Anyone interested should apply to secretary@worthingunitedfc.co.uk with their footballing CV.